There is a little known, but hugely important, justice system which impacts everyone’s life – administrative justice. Made up of various different bodies (including courts, tribunals, complaint handlers and more), it is concerned with the laws surrounding decision-making and dispute resolution of public bodies. In many countries, it deals with more cases than criminal or private civil justice. The system also ensures that government officials make correct decisions in areas such as housing, education, health and social care, and immigration. These decisions often have the greatest impact on the most vulnerable in society. How a country enables people to seek redress against public bodies is an indicator of its approach to the values of equality and dignity. It is something which becomes crucially evident when an administrative justice system fails, such as in the cases of Grenfell Tower and the Windrush scandal. For my newly published report, I looked at how improving an administrative justice system can make a nation fairer and more equal. The report, which focused on Wales, concludes that administrative justice is a cornerstone of social justice. It is an alternative means of holding the state to account, particularly when the effectiveness of traditional legal and political accountability methods are questioned. But in many nations, administrative justice is complex. It can be hard to determine which level of government (federal, regional, devolved or even supranational) has responsibility for different aspects of law and redress. This complexity might be one reason why the system can be “unseen, ignored and unloved” by both policy-makers and the media. Another reason is that redress is seen as a one-off interaction to resolve a dispute. The broader potential to view disputes as symptoms rather than causes of unfairness and inequality can be missed. Across the world, administrative justice systems have not been the product of design. Institutions and procedures have developed bit by bit over time in response to particular public administration problems, and as a consequence of deep rooted social and economic changes. Take, for example, the growth of UK tribunals after establishing a welfare state, or the expansion of ombudsmanry as a non-court based alternative for seeking efficient and effective justice, as well as the other ad hoc redress measures for discretionary welfare payments. This mix can make it hard for people to know what their rights are, and how to seek redress when public bodies make unfair – or just plain wrong – decisions. There have been some UK initiatives to raise the profile of, and provide research into, administrative justice. A new oversight body has recently been established too. International efforts have meanwhile focused on harmonising general principles of law and good administration that apply to public bodies. However, despite the good work that these initiatives have done, what was actually needed was a consideration of whether the whole system of institutions and procedures is clear and accessible. In Wales, however, things are being handled very differently. Wales has an emerging legal jurisdiction, and is currently questioning the future of its justice system. A Welsh view is that good administration is good for you, and that all public decision-making – from government ministers down to individual officers in local authorities – should respect principles of sustainability and equality, and the rights of children, older people, the disabled and future generations. In the areas over which Wales has devolved power, it is beginning to focus on “ways of working” too. This requires public bodies to collaborate with each other to prevent problems occurring. They must also involve citizens throughout the planning and delivery of public services, and in resolving disputes. Wales doesn’t have a perfect system just yet. It is facing challenges familiar to other legal jurisdictions seeking to ensure laws are properly implemented and checks on power are sufficiently robust. Globally, law and redress procedures are increasingly fragmented across a range of sources and institutions. For example, an array of “integrity” institutions have developed in Wales (and elsewhere), including ombudsmen, auditors, and inquiry processes. While integrity institutions have an important role to play, their work in promoting good decision making is not a substitute for effective legal redress. Yet in some jurisdictions their growth has coincided with significant austerity-related cuts to court and tribunal based remedies. Across the world, people may have access to more different types of institutions than ever through which to seek redress. But there is still insufficient clarity as to their powers, functions, accountability and how they are supposed to interact with each other. Accessing administrative justice can be a minefield, or as the Public Services Ombudsman for Wales has put it: “Opaque justice is no justice”. Wales is certainly on the right track but its administrative justice system still needs work. I have made several recommendations, including revising and consolidating legislation, ensuring the system is underpinned by a clear and consistent set of principles, and improving National Assembly oversight. The United Nations describes the Welsh approach to the rights of future generations as “world leading”. 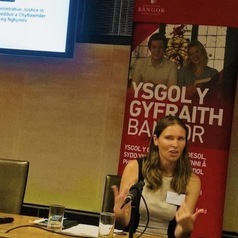 Wales also now has an opportunity to lead international best practice in administrative justice.